A Lesson in Celluloid | Oh, for the Love of Vintage! I hope you’ve been enjoying the ‘A Lesson in‘ series of posts. First Jet was covered, followed by Lucite and Bakelite, and now I’ll be featuring Celluloid. Created in 1869 by John Wesley Hyatt, Celluloid was one of the first plastics ever made. Celluloid is a semi-synthetic thermoplastic made from nitrocellulose and camphor. The earliest form of Celluloid was highly flammable, so in 1927 the nitrocellulose and camphor were removed and replaced by vinegar (making it less flammable). 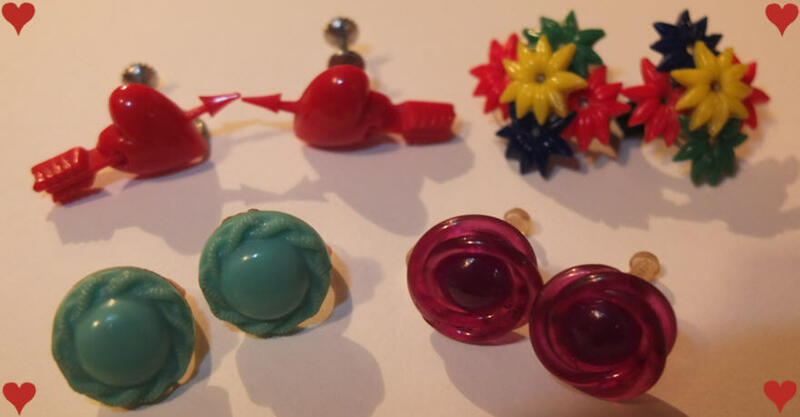 Celluloid was widely used for a variety of items including jewellery, due to its versatility. 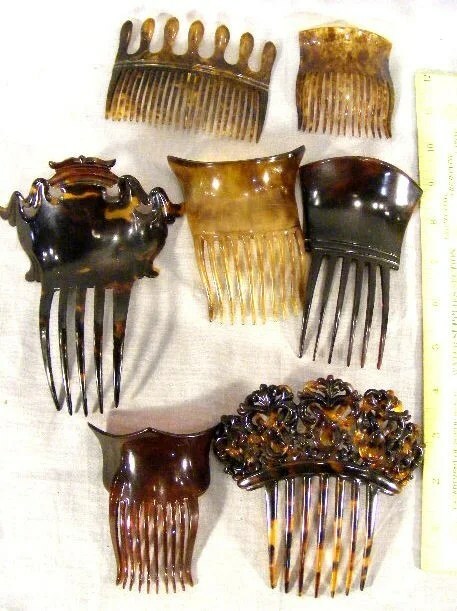 Combs were made that resembled tortoise and necklaces, vanity sets, and other items were made to look like ivory (often referred to as ‘French ivory’). This meant that everyone could own expensive looking items for much, much less! I’m lucky enough to have some of the ‘French ivory’ vanity pieces (thanks Mom), however I don’t have any photos just yet. 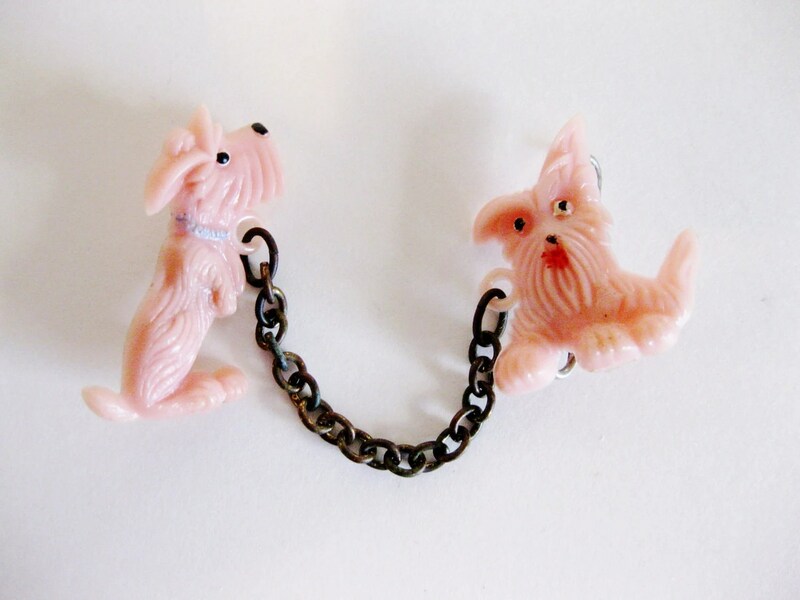 In the 1950s, Japan produced a lot of Celluloid jewellery such as novelty brooches of Scottie dogs, people, flowers, etc. I particularly love this type of Celluloid jewellery as the pieces are so unique and adorable. 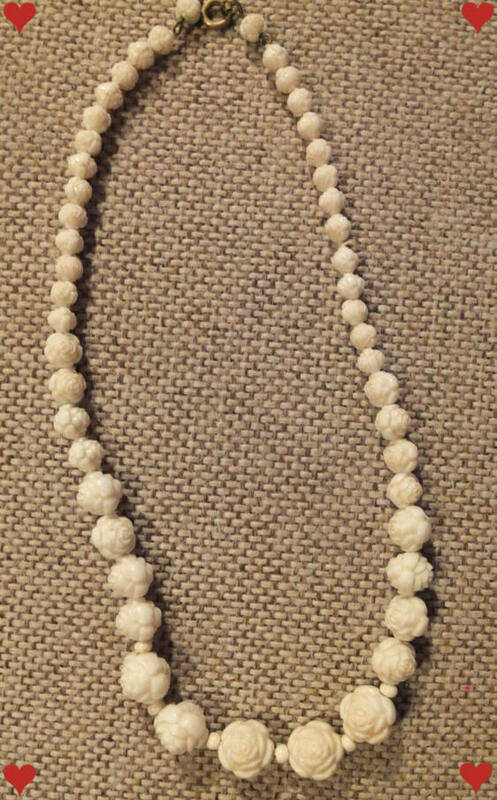 The Look – Celluloid often resembles carved ivory and sometimes tortoise. Celluloid is brittle and can sometimes be identified by its decomposition. If you look closely you may spot disintegration (crumbling), cracks or crystallization. When held in the light, even if the piece is opaque, you may be able to see through it. The Weight – Celluloid is very light. It is much, much lighter and thinner than other vintage plastics such as Lucite and Bakelite. The Smell – Older Celluloid pieces smell like camphor due to the composition of the material. If there is no camphor smell, your piece may be Celluloid dated after 1927 when the camphor was removed. Rubbing Method – Rub the piece between your finger and thumb until it’s hot and then smell it. If you detect a camphor or moth ball smell, your piece is Celluloid. Hot Water Method – Run hot water over your piece and smell it, if it smells like camphor then your piece is Celluloid. Hot Needle Method – Heat a needle until it’s hot and poke your item. It will smoke and smell like camphor. CAUTION: I do not recommend this method as early Celluloid is highly flammable. Do not risk harming yourself or your item, play it safe and use the rubbing or hot water methods! Do you know of any other Celluloid tests? Do let me know! I’m glad you enjoyed it Theadora. You collect toys? So do I! We really need to hit some flea markets together! Have a fabulous weekend! 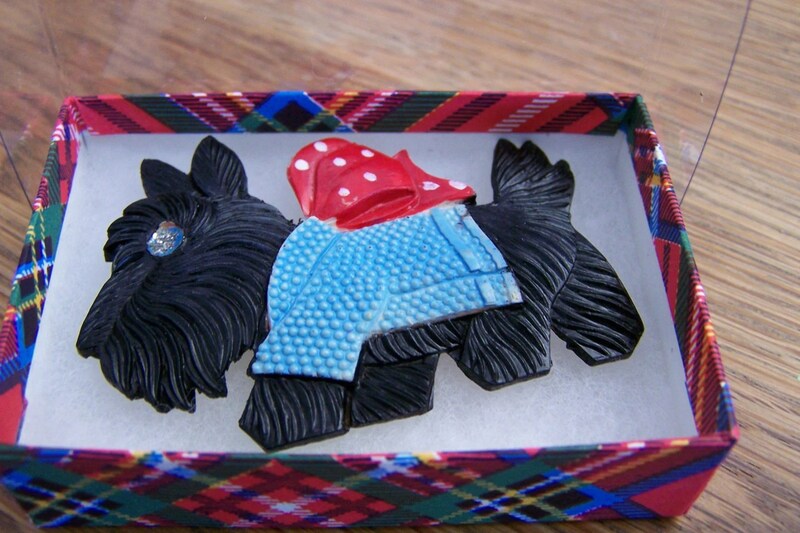 I love seeing Scotties show up in all things vintage. Nice post! Does this smell similar to hot bakelite? Pingback: Oh, for the Love of…Pop-its! « Oh, for the Love of Vintage! I love celluloid, especially the novelty pieces. I’ve sold some pieces to pay for my new jewelry making endeavor, it’s fascinating to study the history too. I was so sorry to see the beautiful piece of French ivory I had go a few months ago, although the collector who bought it truly appreciated it. I’m so glad to have heard of your blog through the B’Sue page. It will be fun to see your items as you teach and reveal them to us. i recently purchased “celluloid necklaces” off ebay, and when they came, they were pliable and “bendy”. vintage celluloid was never pliable and bendy and in fact was hard and brittle, is that right? so i have a couple of fakes on my hands? or was there celluloid that was pliable and bendy to the touch? My best test is through the sound of a celluloid piece, especially against another celluloid object. It is so unlike plastic or any other object, and it resembles the sound od a ping’pong ball bouncing on th table, especially because table tennis balls ARE still made of celluloid. Thanks for the tip with seeing through – it really works! My pieces are from 1950s so they do not smell like camphor. With the sound and light tests I ccan tell 100% now. Hi thanks for this great article. Can you tell me what kind of glue I could use to secure a celluloid disk into it’s setting? It’s not tight and the thing just keeps moving around. An elephant btw. Also is there a way to tell if it’s French? I see no marks on it whatsoever. Brass setting btw. Thanks for any help you can provide! 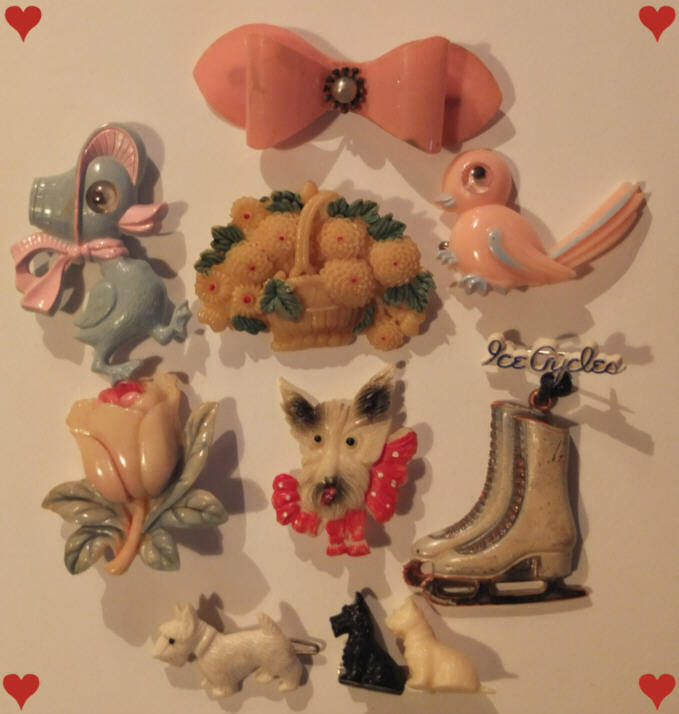 « Kittens, Brooches, and More – Oh My!